Do you have a cute dog? Do strangers often comment on how adorable your dog is? Now is your chance to find out just how cute your dog is. Enter your pooch in PawsAbilities' Cutest Dog Contest! At noon on Saturday, March 13 and Sunday, March 14, show off your adorable dog on the PawsAbilities stage. The audience will decide which dog is the cutest. The dog that receives the loudest applause wins! The top three dogs will receive ribbons to prove that they are the cutest dogs. It's FREE to enter. Sign up at the Dog Olympics registration table the day of the event. No costumes, please. For the Cutest Dog Contest, dogs will be judged in their natural state. For dogs who love to get dressed up, we have a separate Costume Contest. For more information about PawsAbilities and to buy tickets for the event, visit www.pawsabilities.net. Onyx loves playing in the snow, and we wanted to share this video that her puppy raisers took after the big snow storms. These past few weeks, Onyx has been a rambling dog. She went to Cashtown, PA with her puppy raisers Mark and Carol for the Mysterious Journeys Weekend - a weekend of touring the locations of the Ghosts of Gettysburg episode of Mysterious Journeys on the Travel Channel. Onyx spent the weekend at the Cashtown Inn, and she was such a good girl! During dinner, her puppy raisers put her in her crate to relax, but while the speakers were presenting, Carol took the opportunity to practice hand cues. Onyx did great, and she stayed quiet for almost the whole time! Carol used power treats - chicken (one of Onyx's favorites!) and hot dog pieces. Onyx didn't go with Mark and Carol on the actual tour, but on Sunday of that weekend, she got to play with the Cashtown Inn's dog, Barnum. The owners of the Inn closed off the tavern room so the dogs could play without getting into too much trouble! Carol took advantage of the situation and practiced recalls with Onyx. You may remember from our first post about Onyx that when she's playing with other dogs, she tends to ignore the cue to come. Well, at the Cashtown Inn, Carol had Onyx's favorite treat - cheese whiz - and Onyx responded every time Carol cued her to come! Of course, Barnum usually came too, once he found out there was cheese, but it was a definite success for Onyx. This past Saturday, she went on the puppy outing to Chocolate World. Knowing that this would be a challenging experience for the dogs, Carol brought the cheese whiz. Onyx was perfectly fine in the parking lot. In the building, she handled the stairs and rotating floor with no problem. But when it came to getting on the car for the ride, Onyx wouldn't do it. SSD Rossi demonstrated how to get on the car, but Onyx still didn't want to do it. Carol and Mark took her outside to relax, then came back to try it again, but she still didn't like those cars. Even though Onyx balked at actually getting on the ride, she still got good experience being at Chocolate World. She had to go through the turn stile and walk past all the free candy samples Hershey gives away, and she had no problem with either of them. She did fine in the Hershey store and completely ignored the other SSD dogs, keeping her attention on Mark, Carol and the cheese whiz. Chocolate World was very stressful for her, but she still got some good practice. In the photo below, Onyx is the one eating the cheese straight from the can. From Sunday to Thursday (today), many of our puppy raisers have swapped puppies. This is a great experience for both the puppies and the puppy raisers. 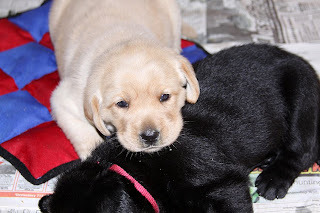 The puppies have to adjust to the ways of a new household and family, which is something they will eventually need to do once they become service dogs. It also gives them experience with different handlers, who might ask for behaviors in different ways. For the puppy raisers, it gives them an opportunity to work wtih another dog. They suddenly have a new puppy with a different personality and behaviors, and the training plans and style they use with their puppy might not work with the new one. they'll have to think outside the box. When the puppies return to their usual homes, puppy raisers usually have lots to share. Mark and Carol swapped puppies with SSD Sienna's puppy raisers. Sienna is a yellow lab and Onyx's sister. So far, Sienna has had several new experiences - meeting new people and dogs and learning to go up longer flights of stairs. She even went to a tour guide meeting and did great! "It'll be very interesting to see everythign that Onyx has learned when she gets back," says Carol. We held our first clicker shaping class last night! We've posted about shaping before, and we've discussed it in puppy classes, but this is the first time we've done a small, hands-on shaping class. This class focused on shaping with a plan. When you shape a behavior, you're breaking that behavior into tiny steps. We use shaping to teach complex behaviors, such as turning light switches on and off. In order to shape a behavior, you need to know what the end behavior looks like, and then break it down into small progressive steps until the dog reaches that goal. If you create a plan before you start shaping, you can be more systematic and you and your dog are more likely to be successful. Keeping detailed records allows you to break a behavior into tiny steps, and gives you, the trainer, a visible plan to follow. You'll be able to see the dog's success as he progresses through the steps. And if he has difficulty with a certain step, you can more easily backtrack to where the dog was successful. When you're shaping a behavior, the dog should have an 80% success rate before you move on to the next step. If you're not having success with a step after three trials, you may need to backtrack. Don't keep insisting that the dog get that step right. You and the dog will just get frustrated. If your dog is having trouble, it's your job as the trainer to figure out why. It may be that you tried to take too big of a step. You may need to go back and break the behavior into even smaller steps. It's important when you're changing the criteria that you only change one thing. What would be a change in criteria? In the Gideon example, a change would be waiting for a head turn rather than just a look. But a change in the dog's actions is not the only thing that counts as a change. If you sit instead of stand, that's a change. If another person enters the room, that's a change. If you move into a different room or take a few steps away from the dog, that's a change. So you need to be careful that you're only changing one thing each time you move to the next step. In the shaping class, we broke into pairs to practice shaping. Each pair was asked to shape one of the dogs (SSD Gideon, Star or Fire) to put their nose in a cone. (Since Gideon already knows how to do that, his group had to shape him to put his entire paw in a ring.) Everyone started with a plan. For example, Fire's handler's decided to start by clicking him for looking at the cone, then move on to clicking for touching the cone. As you can see in the video, Fire quickly caught on to looking at the cone. But when his handlers increased the criteria to touching the cone, it became more challenging. Instead of simply touching the cone with his nose, Fire began biting it. Because he wasn't successful at this step, his handlers backtracked to clicking for looking at the cone. They also adjusted their shaping plan, breaking it into smaller steps. Instead of jumping from looking at the cone to touching the cone, they clicked for looking at the cone for a longer amount of time. As a trainer, the challenge with shaping is to make the steps small enough. When the dog isn't being successful, it's your responsibility to figure out why and adjust the plan accordingly. You want to set the dog up for success. Mary Hunter's Stale Cheerios blog and Karen Pryor's website are great resources for more information about clicker training and shaping. The shaping class was a lot of fun, for both the people and the dogs. Have fun practicing shaping with your dog! Dogs Change Lives Contest Extended to March 14! We love reading your stories about how your dog has changed your life! We've gone through a few boxes of tissues while reading some of them, but every single story has made us smile. In fact, we're extending the submission deadline to March 14. Voting will still start on March 1, but you'll be able to continue submitting stories until the end of the day on March 14. So far, we've read some extraordinary stories. We've read about Largo, a Rottweiler that saved her partner's life by alerting her to a seizure. Ripple, who stuck by her owner through some tough times. Mr. B, whose love helped to heal his owner. Bleu, the dog whose presence helped a young girl sleep calmly through the night. Duke, who guided his family through a blinding snowstorm. And Woozy, a dog that gave a young man new purpose in life. These are just a few of the stories we've read. Every story on Dogs Change Lives is extraordinary, and it's amazing how dogs can touch our lives in large and small ways. Please visit Dogs Change Lives and read these heart-warming stories! Keep submitting your stories about your dogs, and don't forget that voting starts on March 1! Our dogs-in-training visited Chocolate World in Hershey, PA on Saturday. The visit was one of our puppy outings. We hold several outings throughout the year that are designed to give the dogs experience in different situations. The visit to Chocolate World was certainly a test of the dogs' skills. The dogs and their puppy raisers went on the Chocolate World ride, which tells the story of how Hershey makes its chocolate products. To get on the ride, the dogs had to walk down a set of stairs onto a rotating floor. From there, they had to climb into open cars, which take you through the ride. Some of the dogs had no problem getting on the cars. They didn't even hesitate at the rotating floor or the cars. Other dogs wanted nothing to do with the cars. 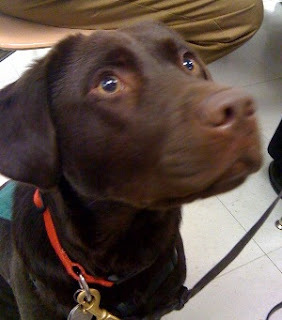 One of our demo/interview/therapy dogs, SSD Rossi, was a calming influence on some of the dogs. By calmly demonstrating how to get on the ride, she showed some of the dogs that the cars weren't something to be afraid of. The cars swiveled slowly from side to side as the narrator discussed different parts of the story. Within the ride, the dogs encountered things like singing cows, active sample factory machinery, and of course, the smell of chocolate. At the end of the ride, dogs had to exit the cars and walk off the rotating floor and go back up the steps. At the top of the stairs, the dogs had to go through a turn stile. And then came one of the big tests. At the end of the Chocolate World ride, Hershey always gives away free samples of its candy, usually a new product. Right now, the new product is Pieces - candies like York Peppermint Patties, Almond Joy and Special Dark Chocolate in a candy-coated shell, similar to Reese's Pieces. That means that there were pieces of chocolate candy on the floor. The dogs got lots of leave it practice! SSD Lavender climbs off the car of the Chocolate World ride. SSD Aspen practices loose leash walking after getting off the ride. SSD Rossi demonstrates a service dog skill for visitors - unzipping a jacket. For Team Training, one of our volunteers made special dog biscuits for each of the new service dogs. The dogs loved them! Does your dog love homemade treats? Do you love to make special treats for your dog? Now’s your chance to win a prize for your dog’s favorite recipe! Enter the Great Biscuit Bite-Off at PawsAbilities! 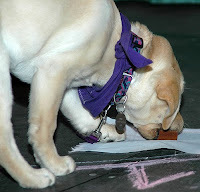 The Biscuit Bite-Off will be judged by our very own service dogs and service dogs-in-training. Visit PawsAbilities’ Great Biscuit Bite-Off for information on how to enter. Don’t forget to buy your PawsAbilities tickets! The big event is coming up soon – March 13-14! While all this snow might make for difficult driving and parking conditions for people, the dogs love it! Nubble has been having a blast in the snow! He would live in the snow, if he could. He romps through the snow and burrows. After a nap inside the house, he’s be ready to go back out and do it all over again. 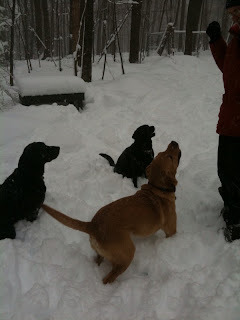 His puppy raisers had a great time playing in the snow with him. “It’s very neat that you can throw a snowball into 20 inches of snow, and a dog will chase after it and find it,” says Donna. 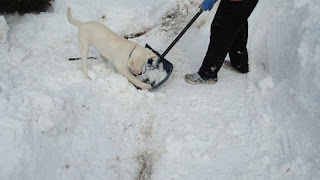 Nubble also tried to “help” Donna shovel. First, he had to check out the shovel. Then he wanted to remove all the snow from the shovel. Finally, he’d chase after whatever snow Donna managed to toss to the side. Last week, we shared Nubble’s first progress with shaping. Donna and Lindsey are working on shaping him to stand on a small platform. When we left off last week, he was putting two feet on the platform. Now, he pivots around it. He has been developing other skills, as well. He has gotten very good at going through doors. We train all of our dogs to wait for the “go on through” cue before going through doors. It’s still a challenge for Nubble to go through the front door because of the temptations of cats and cat food, but he’s getting better. Also, when Donna lets him out of his crate, he waits patiently for the “okay” or “go on through” cue, even when Gizzy is in the room waiting for him. Nice self control! Donna and Lindsey continue to work on loose leash walking. They’ve been practicing in the yard, sometimes with Gizzy, sometimes just by himself. He hasn’t quite caught on yet. Another thing they’re working on is up, all the way up, and off with furniture. While Nubble understands all of these cues, he still tries to climb on the couch when he hasn’t been given the cue. Donna is working on finding a way to make him understand that he can’t get on the furniture any time he wants to. Nubble has gotten bigger! He’s now 41 pounds and can jump over the baby gates Donna was using. Here are two pictures of him in the car. 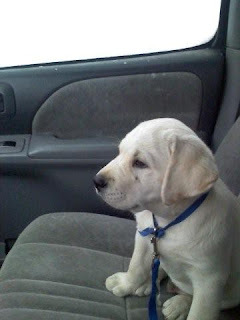 The first one is him as a puppy, when Donna and Lindsey first brought him home. The second is Nubble today. What a difference! He’s now big enough to countersurf, and he does it even if there’s no food on the counter or table. We’ll keep you posted on Nubble and his puppy raisers’ progress in changing this behavior. This week, Nubble went back to the gym with Donna. They worked on stay while Donna did several reps on 4 different machines. He was doing great until one of the gym’s employees walked over to ask Donna about the dog. Once Donna explained that Nubble was a service dog-in-training, the employee understood, but by then, Nubble’s concentration was broken. The trip to the gym, however, was still a success. 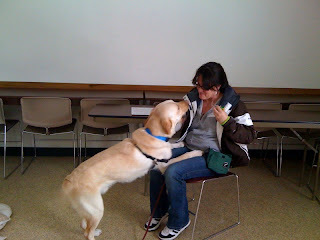 Nubble gave some great stays and Donna had the opportunity to teach someone about service dogs. Nubble also went to a shoe store this past weekend. He was fascinated by all the shoes – what temptations! Donna, her husband and Lindsey worked on stay in the aisle. To make sure Nubble didn’t wander off, Donna’s husband stood on the leash behind the dog. Donna asked him to stay while she walked away. Then she and Lindsey walked away together. It was more difficult for Nubble when both Donna and Lindsey walked away, but by the second time, he stayed nicely. Team Training is one of our favorite times of the year. It’s the time when people who have been matched with a dog through our Meet the Dogs sessions finally get to start training with their new service dog. It’s a lot of work for our trainers, it’s a lot of work for the partners, and it’s a lot of work for the dogs. But every little bit of it is worth it. By the end of Team Training, each person and their service dog will be a closely bonded team, and as they continue working together in the next days, months and years, that bond will grow even stronger. Team Training began on Monday for 6 people who have been matched with dogs. After a morning of learning clicker training and the difference between commands and cues, each person finally got reintroduced to their service dog. When we first brought out the dogs, each person got time to simply bond with their dog, giving them lots of free treats, meaning the dogs got treats just for being themselves. Once the partners and dogs had a chance to get reacquainted, we started working on some basic cues – come, down, sit, and let’s go with loose leash walking. We took some photos and videos of partners practicing the cues with their dogs. SSD Natalie and her partner had a joyful reunion. SSD Sonora (yellow lab) and Lil (black lab) do great recalls for their partners. SSD Cori and Gnat practice loose leash walking. 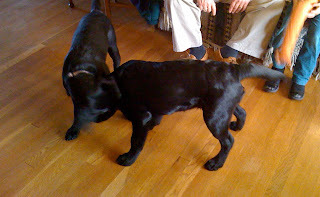 SSD Lil and her partner demonstrate pivot. Notice how Lil's back legs move so she's always right by her partner's side. SSD Mite, an in-home service dog, gets acquainted with one member of his new family. It’s a learning experience for both the people and the dogs. They need to learn each other’s language and learn how to work together. Throughout the rest of the two weeks of training, partners and their service dogs will work on new cues and behaviors. Next week, they will go on several public outings to practice their teamwork in a public place. At the end of Team Training, each pair will be ready to begin their new life together. Team Training is a life-changing experience, for us, the partners, and the dogs. You can read more about SSD and what we do here on our blog. You can also go to Dogs Change Lives and read stories about dogs changing lives that have been submitted by people like you. The 2010 Winter Olympics open in Vancouver today, and you're probably getting in the Olympic spirit. Your dog can get in the spirit, too, for the Frozen Woofys Dog Olympic Games at PawsAbilities 2010! These games will test your dog's speed, agility and obedience. Dogs of any skill level can play! It costs $1 per game ($3 for the Frozen Woofys Cake Walk). Or you can buy a bandana for $15 and play as many games as you want all weekend! You and your four-legged Olympian are sure to have a blast! For more information about the Dog Olympics and PawsAbilities, visit www.pawsabilities.net. Snow is now one of Nubble’s favorite toys. Lucky for him, there’s a lot of it! He burrows into it and pops up covered in the white stuff. He loves snowballs, too. 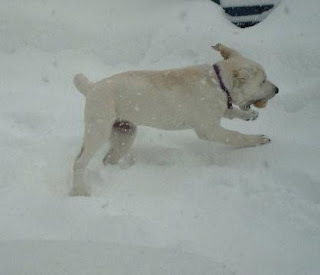 Gizzy, his puppy raisers’ other dog, follows in the path he forges through the snow. He’s getting much bigger! Look at the difference between him and Gizzy! He now has very nice self control when Gizzy is eating. He lies down nicely and just watches her. Self control is very important in a service dog. They need to focus and not give in to whatever distractions may be around. Nubble still has some work to do – he still wants to investigate cigarette butts and food wrappers – but his leave it skills are improving every day. As the dogs grow, they usually go through “phases.” One day they’ll perform skills beautifully and be perfectly behaved, and the next day they’ll “forget” the skills they know and want to romp and play all day. Nubble has been having a great time with a play retrieve, running for the toy and bringing it right back. Lately, however, he’s been playing keep-away with the toy. Donna and Lindsey have been ignoring him when he plays keep-away, but right now, he still thinks it’s a fun game. Last Wednesday, Nubble had his first puppy evaluation. We evaluate each puppy to make sure that they’re on track with their training and to make sure that training to be a service dog is still a good fit for them. We also check in with the puppy raisers. Good news: Nubble is proficient in the puppy cues (sit, come, down, etc.)! And though his puppy raisers need to work on their handler skills a little bit, they’re doing great! Donna and Lindsey have been working on shaping with Nubble. They borrowed a small platform, and they’ve been shaping him to stand on it. So far, he has progressed from just sniffing at the platform to putting one foot, and then two feet, on the platform. He does step all the way up with all four feet, but he still thinks he’s supposed to walk right over it, not stand still on it. We’ll update you on his progress next week! Recently, Nubble went to the gym. His puppy raiser didn’t plan on working out. She just wanted to see how he would react in the new environment. When they first went in, he sniffed around a lot and pulled at the leash, but then he settled down. They walked around, and Donna sat on one of the weight machines. Nubble sat nicely in front of her. Nubble thought the treadmills were very interesting, and Donna used this as an opportunity to work on stay. First they practiced while just being close to the treadmills. Next, Donna stood on a treadmill and faced Nubble. When he showed that he could stay when she stood on the treadmill, she turned around as if she was walking on the treadmill – and he still stayed! Nice job, Nubble! They also practiced stay around the ellipticals, and he did great there, as well. Needless to say, his puppy raiser was very proud of his behavior at the gym! 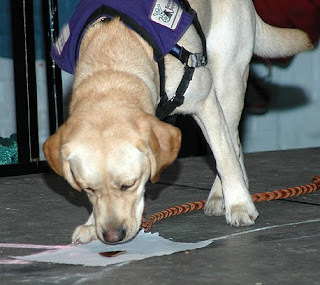 We’ve mentioned that the dogs-in-training learn to give behaviors in all sorts of different environments and surfaces. This week, Nubble encountered several new surfaces. At the gym, Donna had parked next to a drain grate. Nubble walked right over it, no problem. After he got across and heard the water rushing underneath, though, he wouldn’t go back across. It took some time listening to the water before he grew accustomed to it. He also walked on a frozen lake. (If the lake wasn’t frozen, it would have been only six inches deep.) Nubble went slip-sliding all over! He loved it. The snow we're getting in Harrisburg might be keeping many of us stuck inside, but the dogs at the kennel love playing in it! Snow on the kennel runs from the first snow storm over the weekend. We had to clean out all the runs. 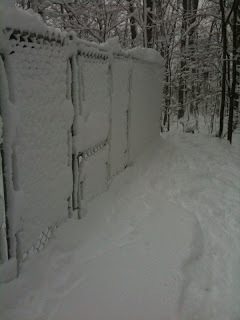 We have a fenced-in run in the woods at the kennel, and we let the dogs play in the snow. We brought some toys out for the dogs to play with in the snow, and they got really excited. We hope you and your dogs have fun in the snow, too! Ultimate Air Dogs Are Coming to PawsAbilities! 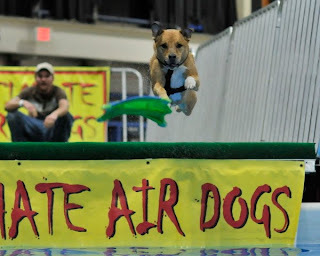 New this year, Ultimate Air Dogs will be making a serious splash at PawsAbilities 2010! The dogs in this dock jumping organization seem to fly as they leap 10…15…20…25 feet off the dock into a pool. 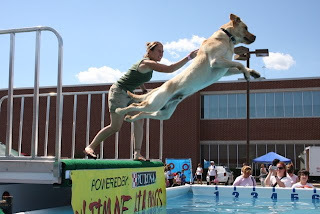 Dogs will be able to compete in two categories of dock jumping: Splash, which is the equivalent of a long jump, and Catch It, which is Ultimate Air Dogs’ special twist on Splash. Instead of simply leaping off the dock, dogs must also catch an object in the air! 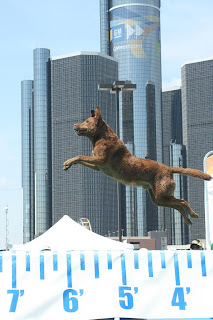 You and your dog can participate in Ultimate Air Dogs at PawsAbilities. Any dog can participate, no matter what their experience. This is a popular event, so make sure you pre-register with Ultimate Air Dogs to reserve your spot! 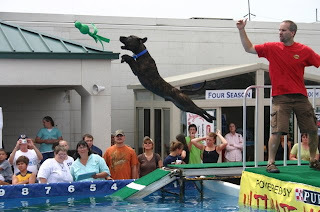 For more information about Ultimate Air Dogs, visit their website at www.ultimateairdogs.net. Don’t forget to buy your tickets for PawsAbilities! They’re available online from now until March 8 - $8 for adults, $4 for children. You’ll also be able to purchase tickets at the door - $10 for adults, $5 for children. Visit www.pawsabilities.net for more information about all the fun! Onyx was working hard on her homework for puppy class this week. At puppy classes, we often give puppy raisers certain skills to work on with their puppy. This past week, the puppies and puppy raisers were given homework to work on visit, leave it with food, down and stay. You might remember from previous posts that Onyx really knows down. In fact, lately she has started to yawn when she goes into a down. During puppy class, we were working on hand targeting, which means the puppies touch their nose to their puppy raiser's hand. Targeting is an important skill for the dogs to learn. It can be used to teach the dogs to turn light switches on and off and to press the button to open automatic doors, among other things. At puppy class, Onyx seemed more interested in the other dogs than in practicing targeting. 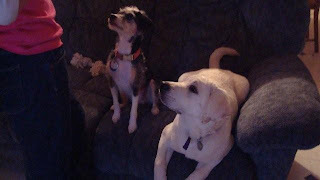 Her puppy raisers tried moving her to the corner of the room, and eventually to the hallway, to eliminate distractions. Once one of the trainers came over and started working with her, though, she really focused and did great. She seemed to know that the trainers mean it's time to work. Onyx does not seem to be afraid of other dogs, which is a good thing for a service dog-in-training. As Carol and Mark were leaving puppy class with her, SSD Stetson and his puppy raiser were coming in. Now, Stetson is our largest dog-in-training, weighing nearly 92 pounds. But his size didn't bother Onyx. She went running right up to him to say hello. When she got a little too enthusiastic, Stetson held her off with his head - a funny sight to see because his head is half as big as she is! Onyx also got to see her brother Denim again! when these two pups saw each other, they reared up in excitement, ran toward each other and began playing. Onyx is now practicing loose leash walking every day. While she was in Gettysburg with her puppy raisers, Carol took her for a walk, but Onyx did not do very well with loose leash walking. She didn't want to listen to any of Carol's cues. Carol had to cut the walk short. 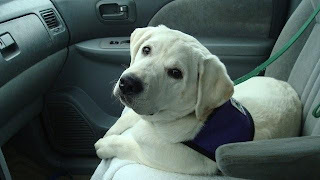 This particular time, Onyx was not wearing her service dog-in-training harness. Often, the dogs learn that when their harness is on, it's time to work. When the harness is off, they can relax and have down time. When they work on loose leash walking, Carol plans to dress Onyx in her purple harness and see if that makes a difference. Like all skills, loose leash walking is one that requires practice. This past week, Onyx had some new experiences. The pier behind Mark and Carol's house flooded, and when the water receded, Onyx went down to investigate. There was a large piece of wood floating by the pier. Onyx probably thought the wood was part of the pier because she stepped on it - and stepped off real quick when it moved! Later, she found some chestnuts floating in the water, and she tried to get one. Carol says she looked like she was bobbing for apples. Onyx seemed to know what she was doing, though, because when her nose was underwater, she blew bubbles. She did eventually get a chestnut, and she carried it around with her. Read more about Onyx's progress next week. 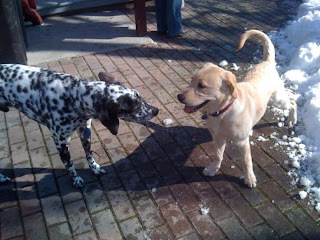 A little over a week ago, Nubble went to high school with his puppy raiser, Lindsey. She was giving a presentation on dog training in her English class, and Nubble provided an excellent visual. He was very well behaved, doing everything Lindsey asked him to do, including rolling over on cue! When he wasn’t demonstrating his skills, he sat nicely at Lindsey’s feet and at one point stretched onto his back and played with his leash. When the bell rang to signal the end of class, Lindsey and Nubble waited a few minutes for the halls to clear before leaving. This is a great example of setting the dog up for success. When dogs are in training, especially early in their training, crowded places can be very challenging. Lindsey and Nubble practiced walking the school hallways when they weren’t as crowded, so Nubble had the chance to get used to the environment and successfully give behaviors. Nubble seemed to take walking in the hallways and sitting in the classroom in stride. Soon, he’ll be going to school for longer periods of time. The next day, he visited a horse farm for Lindsey’s riding lesson and met four new dogs – a Great Dane, two labs and a little Jack Russell. He had a great time playing with them. So far, he seems to get along with all types of dogs. While at the horse farm, he had another new experience – he saw a creek for the first time! He seemed enthralled by the moving water. All in all, it was a busy day for Nubble, and he was asleep almost as soon as he got in the car. Nubble has been doing very well with leave it and recalls. He loves when Donna and Lindsey throw a toy for him. He runs to retrieve it and drops it at their feet. (Although, sometimes he’ll take it to their dog Gizzy instead.) Recently, Lindsey was running outside with him and she dropped the clicker. Nubble stopped, picked it up, and brought it to her, dropping it at her feet! He is certainly a character! One day, Donna was walking Gizzy and Nubble. Gizzy was on a long Flexi-leash, while Nubble was on a short nylon leash. By accident, Donna dropped Gizzy’s leash, and before she could pick it up, Nubble picked it up and ran with it! There they were, Donna holding Nubble’s leash and Nubble holding Gizzy’s leash! Donna and Lindsey are having a great time raising Nubble. Lindsey is training him as part of her senior project for school. "It's teaching me lots of patience. I've never had a puppy this young before. I've learned that it's a lot of work, but it is well worth missing a little sleep!" Several of our dogs in advanced training had a real challenge on Thursday. They had to ignore the smells of fresh meat, fruit, vegetables and desserts as they practiced their skills. We went to the Broad Street Market in Harrisburg, PA - a farmers' market with a smorgasbord of smells to challenge the dogs as they practiced their skills. When the dogs are in advanced training, we go to different public places to practice. Because the dogs will be going everywhere with their partner, they need to be able to give behaviors no matter what environment they're in. With the help of a wonderful group of volunteers, we take the dogs out in public once or twice a week. The Broad Street Market was one of our most challenging outings for the dogs, but they did very well! We worked on skills such as loose leash walking, go on through at doors, leave it, greeting people, retrieves and basic obedience. 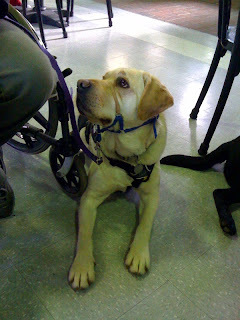 Some of the dogs worked on their skills around wheelchairs, such as opening doors and pulling the wheelchair. In this video, SSD Natalie practices recalls. It's particularly challenging to give this behavior in a strange environment where there are so many smells to investigate and new people to meet. Natalie does a great job ignoring all the distractions. SSD Gnat opens a door for a person who uses a wheelchair. Doors, especially heavy doors, can be challenging for a person who uses a wheelchair to open by themselves. 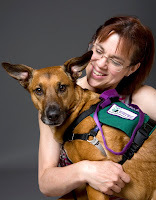 A service dog can be trained to open the door and hold it open. The new environment made this skill a little more challenging for Gnat, but that's what practice is for. He soon focused and opened the door like a champ. Gnat and SSD Sonora are learning how to pull a manual wheelchair. Look for a blog post next week about how these two dogs are learning this skill. Our public outing to the Broad Street Market was a great success! Thank you to the Broad Street Market for being so understanding about service dogs!